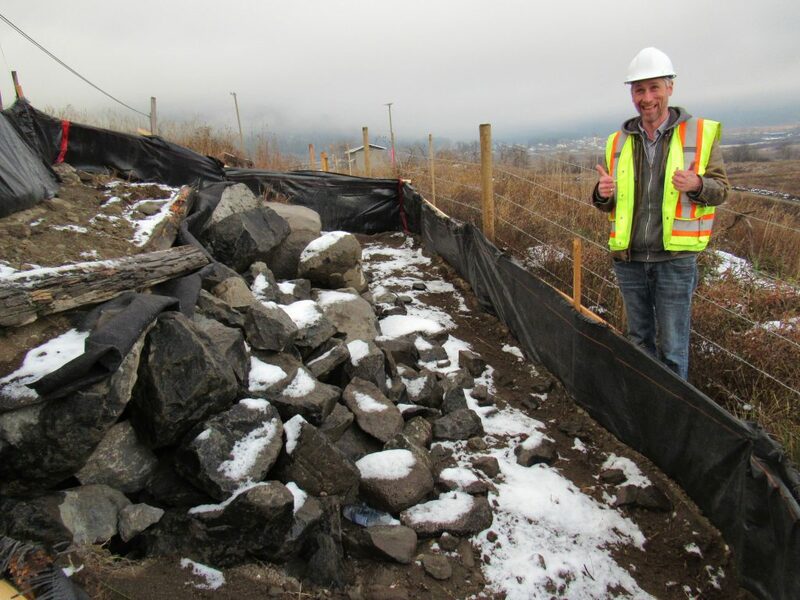 We build a lot of structures in BC – overpasses, multi-use paths, snowsheds…even garter snake homes! Yes, you read right – garter snake homes! We recently constructed a winter den for snakes, because sometimes big new structures that are going to make life better for us humans, disrupt the lives of other creatures. That was the situation in October 2016, during expansion of a section of Highway 97 to four lanes, which runs alongside Sugar Cane Indian Reserve, near Williams Lake. 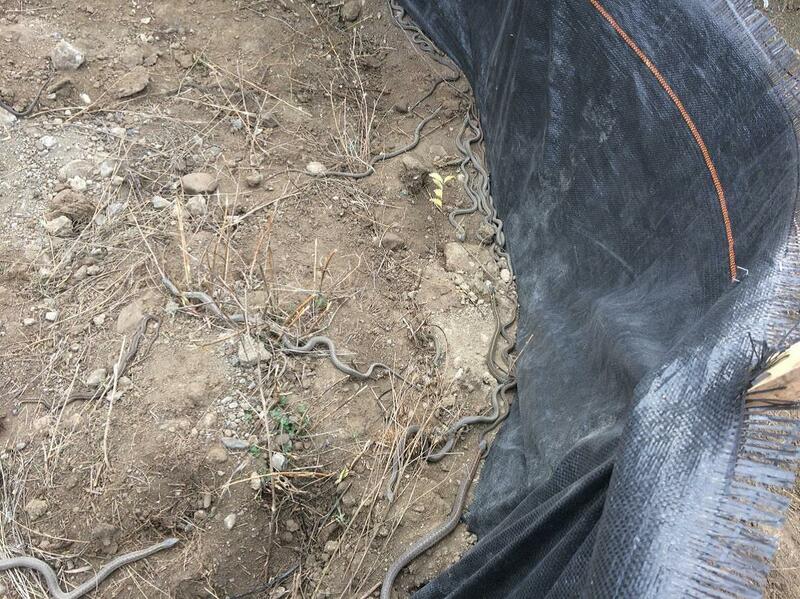 Workers discovered about 200 snakes settling in for winter, in a den of shale layers. The environmental monitor for the project identified two types – the Common Garter Snake and the Western Terrestrial (Wandering) Garter Snake. Both are common in BC, but the size of the nest was unusual for this part of the province. The snakes were in harm’s way and a solution needed to be found. The Ministry of Forests, Lands and Natural Resource Operations provided a permit to capture the snakes. Several wildlife biologists, including one from the British Columbia Conservation Foundation rounded up the 200 snakes by hand, with help from the workers on site. This is a task not recommended for those with herpetophobia! It’s also not for anyone who triggers easily – the Wandering Garter Snake is commonly misidentified as a rattlesnake, because of its spotted markings. They look quite different from the Common Garter which has a black to greyish green body, bright yellow to greenish stripe, and is 46 centimetres to 1.3 metres long. When captured, both types of snakes may try to escape by releasing a smelly mix of musk and feces, which they smear onto their captors, as they writhe. If they can’t escape, they may also flatten their heads and strike aggressively, and in the case of the Wandering Garter, bite (the toxin isn’t harmful to humans). from the edge of the expanded road – was chosen for a winter dwelling. In the meantime, the ministry provided funding for new home construction, and the biologists and our site contractor obtained the materials. Ministry folks worked with the wildlife specialists on the site logistics and design for a hibernaculum – a cozy place for snakes to hibernate. Our construction contractor then excavated a shallow pit of about 1.5 metres deep, and four metres by four metres, to provide an insulating base for the snakes. Boulders, fabric, and soil from the pit were placed over and around the depression. In all, almost a metre of materials were placed overtop – enough to keep the hibernaculum and its new residents frost-free. The area was enclosed with a fabric fence, so that when the snakes were released from the container, in cooler November, they slithered into their new home. Garter snakes have been seen in the area since, and we continue to monitor the site, to see how they’re doing. We have a trail cam set up to capture their comings and goings. From the snakes’ new home, it’s a downhill slither, to reach their summer lake habitat. There, the reptiles can bask in the sun, stay clear of predators by slipping into the water, and feed on a varied diet of earthworms, insects, salamanders, slugs, tadpoles, toads, frogs, fish and small mammals. In fall, the snakes migrate back to their hibernaculum, where they settle in for the long sleep of winter, as motorists drive a safe distance away, along Highway 97. Thank you to Thompson Rivers University and the BC Ministry of Environment for your rich information that we drew on, about garter snakes and their behaviour, from The Reptiles of British Columbia.